Sign up to our news letter? £4m sales in just 3 months since launch! 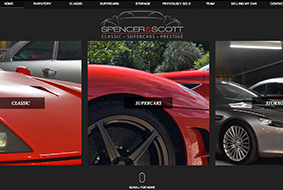 Areca Design was asked to design a website, incorporating a brand new memorable logo, that would be attractive to the supercar-set, showing-off the range of prestigious, classic supercars which Spencer & Scott buy and sell. Between them, Nik and Louis have many years of experience of dealing in hyper-cars and they have built a strong network of collectors as passionate as they are about classic cars and the latest and greatest supercars to leave their respective factories. Areca Design is a creative graphic design and internet marketing Agency, based in the heart of Worcestershire. Between our team of specialist designers, developers, coders and marketers, we have over 30 years experience in delivering innovative marketing solutions to businesses from every sector. We effectively support both SME's and International Corporations with end-to-end integrated marketing and advertising support. Both online and offline support includes: website design, search engine optimisation (SEO), email marketing, digital marketing, graphic design, brand management, photography, video AV production, exhibition stand supplies, printed materials, branded corporate gifts, direct mail, advertising and unique promotional campaigns. Copyright © 2019 Areca Design / All rights reserved. Database rights protected.